Perched in the cockpit of one of the newest military aircraft in the world as it streaks through the sky, I've got a front row seat for a Brazilian sales pitch aimed at unseating an American icon. 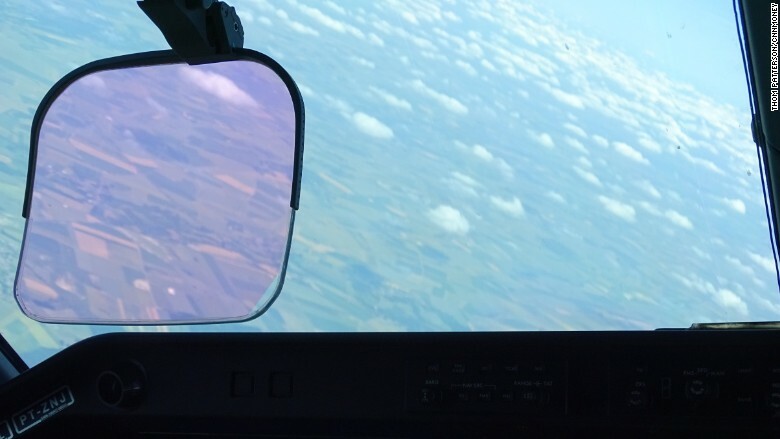 The view from the cockpit of Embraer's KC-390. 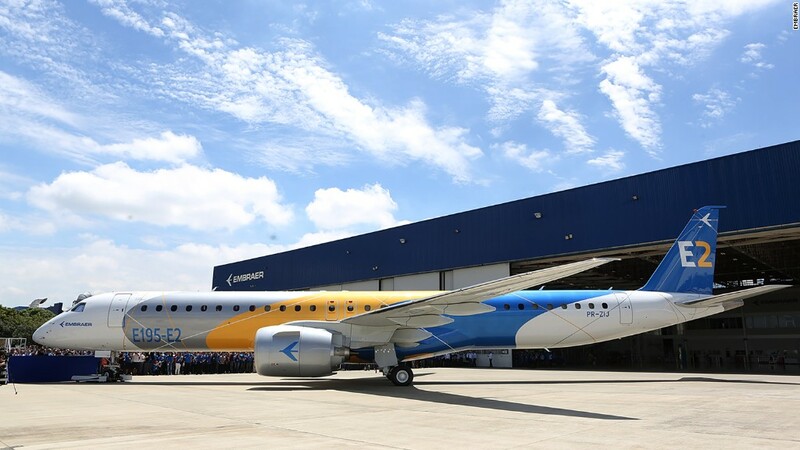 Better known for its small commercial airliners, Embraer has, until recently, avoided going head-to-head with bigger manufacturers like Boeing (BA) and Airbus (EADSF). "In some ways, this jet is a proxy to Brazil's rise as a global power," says to a report by Richard Aboulafia, Vice President of Analysis at the Teal Group, an aerospace consultancy. 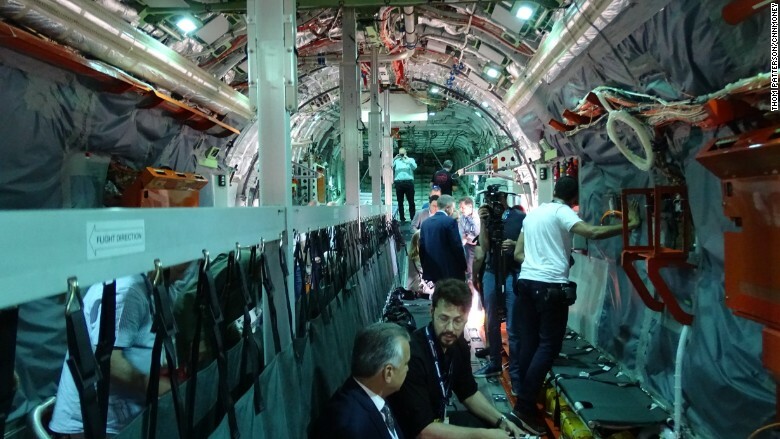 The nearly 61-foot-long cargo deck of the new KC-390 can carry anything from armored vehicles and troops to humanitarian supplies and aerial refueling equipment. Zipping along at 300 mph and 15,000 feet above the French countryside, it's hauling journalists for the first time. Heavily updated little by little over the years, the U.S. Air Force is flying the latest model of the C-130J Super Hercules. Inside the KC-390's 61-foot-long cargo hold. It has new engines and avionics, but the aircraft is the same basic shape that is has flown more than 23 million flight hours over 60 years -- 1.6 million for the C-130J alone. And the U.S. military's stamp of approval is no small hurdle to overcome. That's "more than just a product endorsement," Aboulafia said. It's a guarantee that spare parts will be plentiful around the globe and the C-130 will continue to be upgraded for decades to come. Both the KC-390 and Lockheed's Hercules are designed to land on short, unpaved dirt or sand runways, and their engines can withstand the beating from rocks and dust. But the faster jet-powered KC-390 has a 140-mph speed advantage over the 400 mph, four-propeller driven, Hercules. Embraer says the KC-390 can haul up to 50,000 pounds of cargo on its 19-foot longer cargo deck - about 6,000 more than Lockheed's plane. Perhaps most essentially, Embraer thinks it can replace the C-130 for less money. The estimated price for each KC-390 would range between $50 million to $55 million, according to a 2016 report from the Teal Group -- around $15 million less than the Hercules. It's "a fantastic cargo box for the price," said Aboulafia. 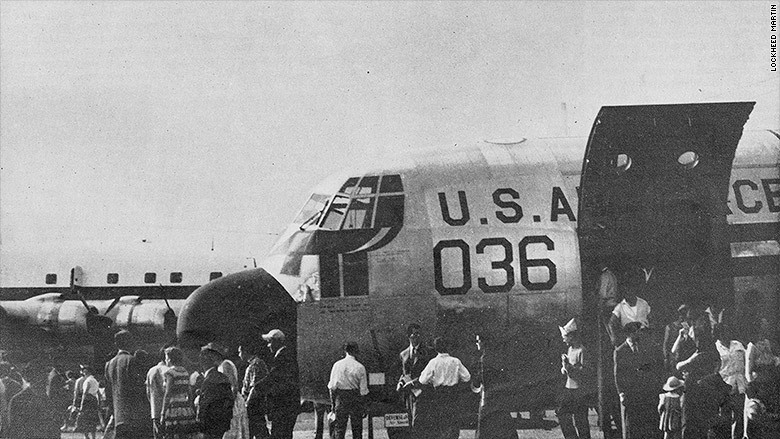 Lockheed's C-130 made its Paris Air Show debut in 1957. Embraer is betting that politicians and taxpayers will give the KC-390 an advantage. But Lockheed's motto is "the only replacement for a Herc is another Herc." The Brazilian rival may be less expensive, but there are attributes of the Herc that it can't match. The C-130's straight wing can get it off the ground faster in battle with more troops or cargo. "If you're looking for combat lift, I think that the Herc's just going to have an advantage," Aboulafia said. "If you're looking to simply deliver stuff from one airfield to another, the KC-390's probably going to have better economics." Currently only two experimental KC-390s are flying, and the airlifter is still being tested, so it will be a while before it can declare victory.